These pages focus on the proportional systems on the ballot in BC’s referendum. Note: Single Transferable Vote is not on the ballot in BC’s referendum but is a key component of Rural-Urban Proportional. With Rural-Urban Proportional, STV would be used in the urban and semi-urban areas. All of the proportional systems on BC’s ballot are a huge improvement over our current system, first-past-the-post. Proportional representation is a principle underlying a voting system: People should be represented in proportion to how they voted. The percentage of seats a party has in the legislature should reflect the percentage of people who voted for them. With made-for-BC proportional representation, almost every vote will count towards the make-up of the legislature. 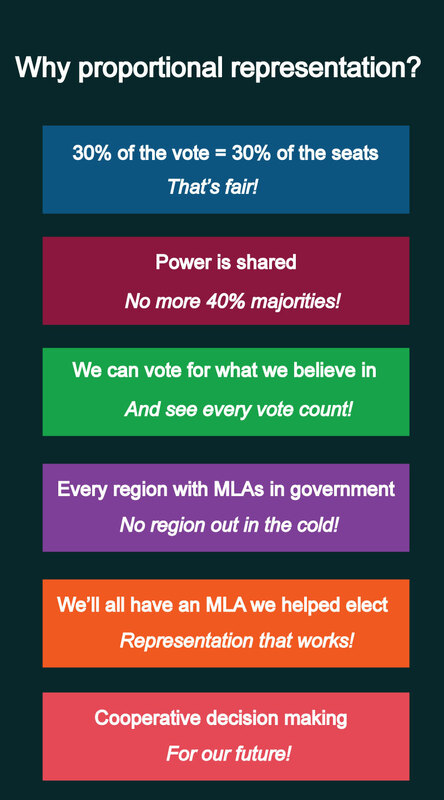 Almost every voter will help elect an MLA who shares their values. All regions of BC will have representation in both government and the opposition. A single party will no longer be able to attain a majority government with just 40% of the vote, and cooperation and compromise will become the norm. There are several different ways proportional systems can be designed. Fair Vote Canada BC is pleased that that the proportional systems BC voters will choose from in the 2018 referendum are “made-for-BC” designs – maintaining strong local and regional representation, and ensuring MLAs are elected by the voters, not chosen by the parties. This effectively eliminates any system with province-wide closed lists. Gisela Ruckert, President of Fair Vote Canada BC and leader of Fair Vote Kamloops, explains the three pro rep options on the second part of the ballot to Kamloops This Week.